On Friday 11 December 2015, Pierre Bergé & Associés, in collaboration with Sotheby’s, will auction the first part of the personal library of Pierre Bergé. This unique collection, assembled over several decades, gathers some 1,600 rare books, manuscripts and musical scores dating from the 15th through the 20th century. Beginning with St. Augustine’s Confessions, printed in Strasbourg around 1470, up to Scrap Book 3 by William Burroughs, published in 1979, it spans six centuries. Grounded, from the outset, in the literary passions and the ardor for a few favourite writers – Montaigne, Flaubert, Stendhal or Gide -, the library is in the image of its creator, in other words, counter to mere accumulation and guided by emphatic – and assumed – likes and dislikes, as much as by the sheer pleasure of the texts. It is the portrait of a life. Long kept secret, the library is the most intimate of all the collections assembled by Pierre Bergé and has been the subject of an exhibition but on rare, confidential occasions until it was partially revealed at the Bibliothèque de l’Arsenal in 2013. As of July 2015, a travelling exhibition of 60 selected works will be take place successively in Monaco, New York, Hong Kong and London. 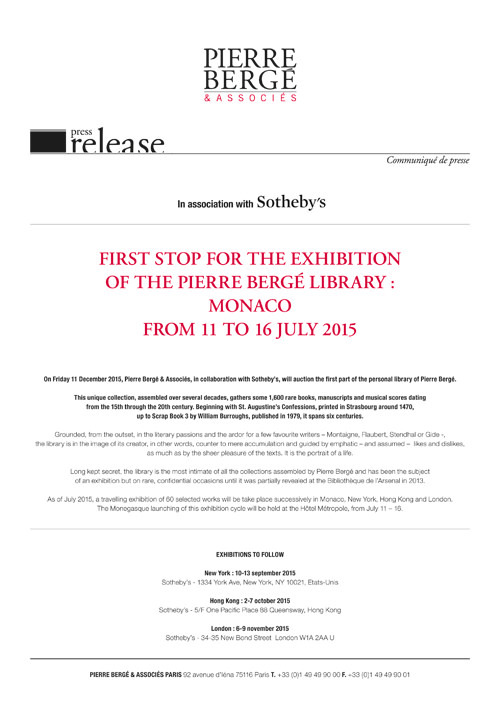 The Monegasque launching of this exhibition cycle will be held at the Hôtel Métropole, from July 11 – 16.